Squirrel proof bird feeders block squirrels from bird feeder seed. 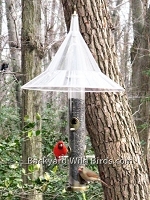 A hanging Squirrel proof feeder can use a Squirrel Proof Baffle above or Cage bird feeders. Squirrel Proof Baffle Domes need a larger than 18 inch diameter to effectively block squirrels from above. Some of the wire mesh and wire screen bird feeders are squirrel resistant in that squirrels have a hard time chewing thru metal and can't get too much seed or clean it out. They can be a good compromise if you are not able to restrict the squirrel’s access to a bird feeder. A cage bird feeder can block access to squirrels and also larger birds. The songbirds can pass thru the grid that surrounds the feeder. You can see a great selection below of all the different styles of squirrel proof bird feeders. Bluebird Baffle Bird Feeder with its beautiful sapphire blue dome is designed to attract bluebirds, orioles and their fledglings. The Wire-formed cage cylinder allows bluebirds access to their mealworms. 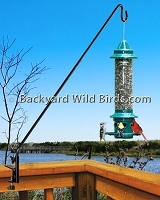 Cattail Sunflower Stake Bird Feeder are 2 very nice wire mesh bird feeders. Clinging birds like Woodpeckers, Chickadees, Goldfinchs, Nuthatches, etc. will love these 3 feet tall feeders. Can be located in the best place for viewing like in a flower bed, garden or just outside a low window. Copper Squirrel Proof Bird Feeder is a brushed Copper finish Squirrel Proof Tube Bird Feeder with 6 ports and roof. The all metal squirrel resistant cage design prevents squirrels from reaching the bird seed. The Extended Pole Squirrel Blocker Feeder is a great deck pole with a Squirrel blocker feeder. It is notoriously difficult to have squirrel proof bird feeders on Deck poles because the pole can not be baffled like a ground pole. 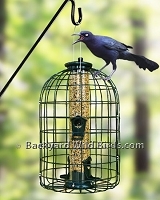 Grackle Proof Bird Feeder will stop grackles and squirrrels from your bird feeder. This caged 4 port sunflower seed tube feeder wiill keep those grackle black birds on the outside and let smaller songbirds pass thru. 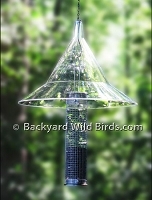 Great with our Deck Bird Feeder Poles or standard poles. Excellent Hanging Baffle and best tube bird feeder together make a great squirrel proof bird feeder that you will enjoy for a long time. Mandarin is a Hanging Bird Feeder that's a great squirrel proof and squirrel stopping bird feeder. It has 4 divided chambers with four seed ports. 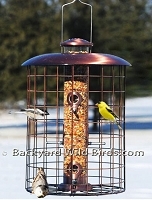 Metal Mesh Bird Feeder with Roof Extension is a yellow wire mesh bird feeder for sunflower seeds. 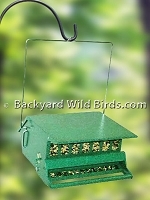 The sunflower feeder is an all metal feeder that will deter pests and resist squirrel damage. 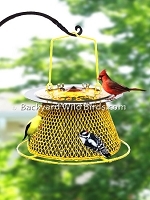 This 10" diameter sunflower bird feeder is a unique collapsible wire mesh metal bird feeder. 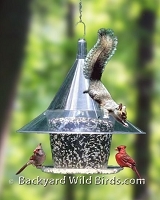 Squirrel Blocker Bar Feeder is the Bird Lover's choice for squirrel resistant feeders with adjustable weight settings. Spring operated perch with adjustable weight setting closes access to seed. 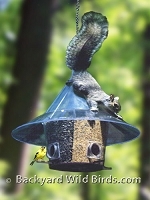 Squirrel Blocker Mini Bird Feeder is an affordable Squirrel Blocker feeder with unbeatable Squirrel Buster technology. This 3/4 quart bird feeder is not only squirrel proof but also useful with some larger nuisance birds. Squirrel Blocker Sunflower Bird Feeder raises the standard as a buster of squirrels. Feeder makes a great Deck Squirrel Proof Sunflower Bird Feeder. Very useful anyplace that the feeder alone is the first line of defense. Squirrel Defeater Bird Feeder will feed songbirds not squirrels, grackles, doves or starlings. 3 individually weight-controlled seed ports allow uninterrupted feeding at other ports. Weight controlled seed ports close down under a squirrel's or large birds body weight. Squirrel Dipper Bird Feeder prevents squirrels from eating all your bird food! You save money on seed when you use a Squirrel proof Dipper. The Dippers four seed ports have individual weight sensitive perches. Squirrel Proof Baffle Feeder is a hanging squirrel baffle with peanut bird feeder. Feeds a variety of wild birds without feeding the squirrels! 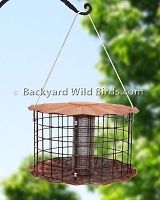 Squirrel Proof Cage Bird Feeder is large capacity bird feeder that really stops squirrels! The Squirrel Proof Bird Feeder blocks gray squirrels, grackles and mourning doves from reaching tube feeder bird seed. Squirrel Proof Feeder is a classy clear 20 " bird feeder baffle and peanut spiral bird feeder below. Sky Cafe is a hanging bird feeder that is a squirrel proof bird feeder favorite and great fun to watch. Cardinals make good use of the tray that goes all the way around. Squirrel Proof Suet Bird Feeder is squirrel, grackle and starling proof suet feeder with hanging chain, made with cage wire. Very easy to fill with two suet cakes. Squirrel Proof Tube Bird Feeder is a popular 6 port cage bird feeder! The Squirrel Proof Bird Feeder blocks gray squirrels, grackles and mourning doves from reaching tube feeder bird seed. The Sunflower Mushroom Bird Feeder is a metal Sunflower Bird Feeder. The Mushroom wire mesh feeder has a nice 8.5" weather baffle above to keep the seed dry. The metal wire mesh is just the right size for Sunflower bird seed. Sunflower Wire Mesh Bird Feeder is a large capacity wire mesh bird feeder. 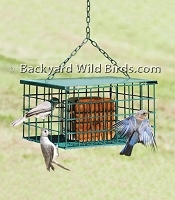 This all metal feeder is squirrel resistant that clinging and perching birds will love to use. 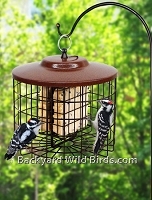 Works well with any of our Deck Bird Feeder Poles and Bird Feeder Poles. One of the best!